I haven’t had the best of luck with 50k’s in my running history. They were either training runs for something bigger (remember my back to back 50K weekend at Ray Miller? ), incredibly hard (i.e. Orcas), short course (Shadow of the Giants) or DNFs (Ridgecrest and Montana de Oro). So when I heard about Way Too Cool being a fast and runnable course, I jumped on the lottery train…along with 1,000+ other runners. 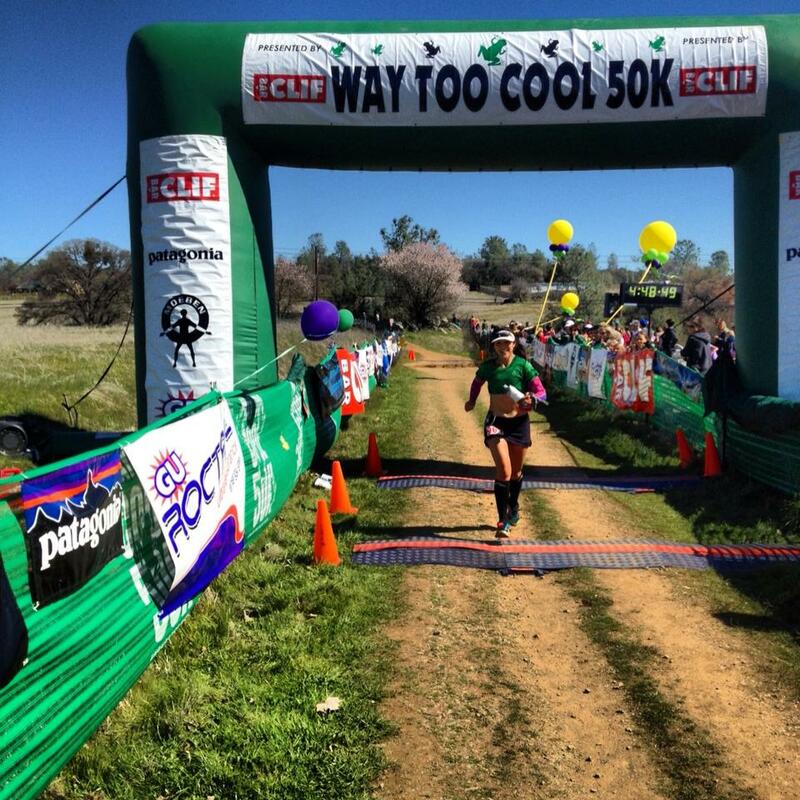 Apparently Way Too Cool has become the most sought after 50K in the U.S for beginners and experienced runners alike. The odds were in our favor since they opened it up to 1,000 runners this year so I was happy to get a spot on the entrants list. 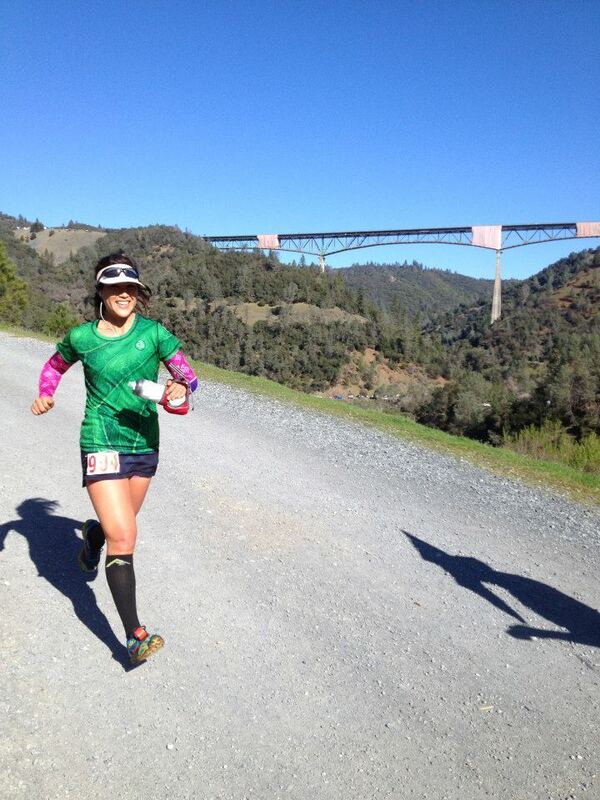 The course is 98% single track, runs along the American River and parts of the Western States course in Auburn. If it was anything similar to the trails on American River 50 and what I’ve seen from Western States, I knew we would be in for a treat. With the “lower” elevation gain on this course (4,851), I knew I had a chance to beat my current PR time, which wasn’t too difficult for the reasons mentioned above, but also run a good race. The race started at 8AM which was nice to be able to sleep in for a bit before making the 50 minute drive from Sacramento to Cool. The weather was chilly and cool (ha ha) at the start, warming up later in the day. T-shirt and shorts were perfect running attire. The race was sectioned off into 2 wave starts (8AM and 8:10AM) and within the wave starts were pace per mile signs posted so people knew where to line up. I was in the first wave and lined up in between the 8-9 min/mile group. Ran into old and new friends, finally got to meet Aron (!) and before I knew it, we were counting down to the start. The first 1.5 miles was on the road so naturally I flew out of the starting line like a caged bat, clocking a 7:02 mile, oops. Matt caught up and asked what the hell I was doing running like it was a 5K. Everyone around us was running just as fast! It was a race just to get on the single track trail ahead. 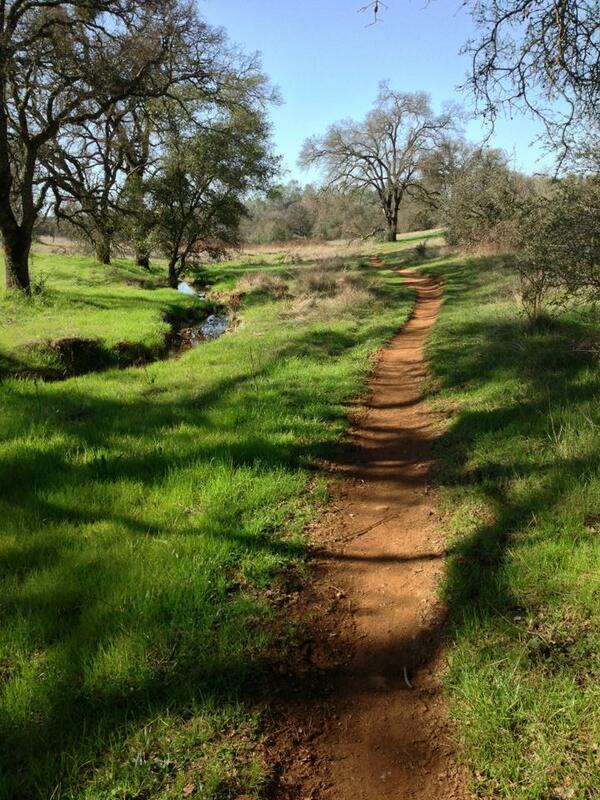 When the trail emerged on the left, runners charged forward to make their way onto the trail. The first 8 mile loop would take us right back to the Start/Finish line. Since I started off so fast, I felt the need to keep pace with everyone else and being stuck in the single track train pushed me to run faster than I really wanted to. Toward the end of the loop, Thomas caught up and we clocked in at the 8 mile mark in 1:05. Must. slow. down. The next 23 miles consisted of a big loop before returning to the finish. It didn’t take long to slow me down, after leaving the first aid station, my legs were starting to feel the pace from the first loop. I let Thomas go ahead as I walked a little and ate a GU. Luckily, there was a big downhill from Miles 9-11 where I finally started to regain energy and shifted into cruise control. 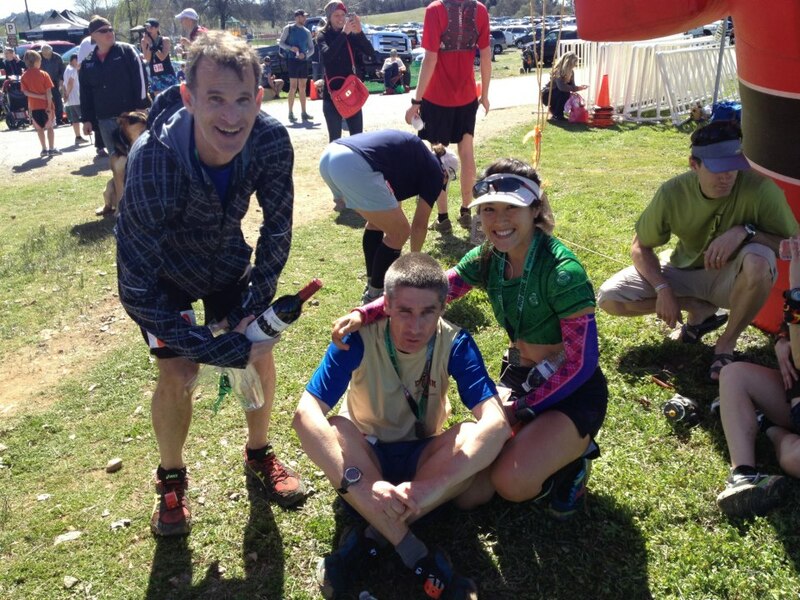 We crossed over Highway 49 to the second aid station at Mile 11 where I downed some Coke and GU Roctane. Still feeling great from the downhill, we made our way to Maine Bar while running along the American River. I loved this section because it was mostly shaded and the terrain was easy to run on. 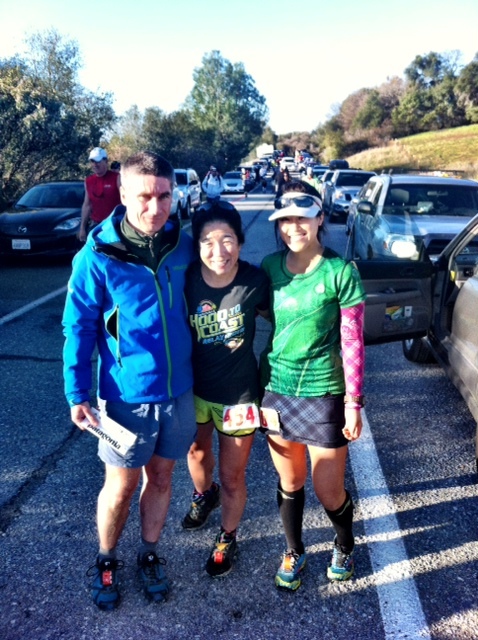 I got into the next aid at Mile 16.7 feeling pretty good, but knew most of the hills were in the last half of the race. I ended up catching up to Thomas again somewhere along this stretch as we power hiked the hills and kept a decent pace on the runnable sections. We both agreed there were more hills on this course than you would think. Even though there are no mountains to climb per se, the rolling terrain really takes a hit on your legs, especially towards the latter part of the race. 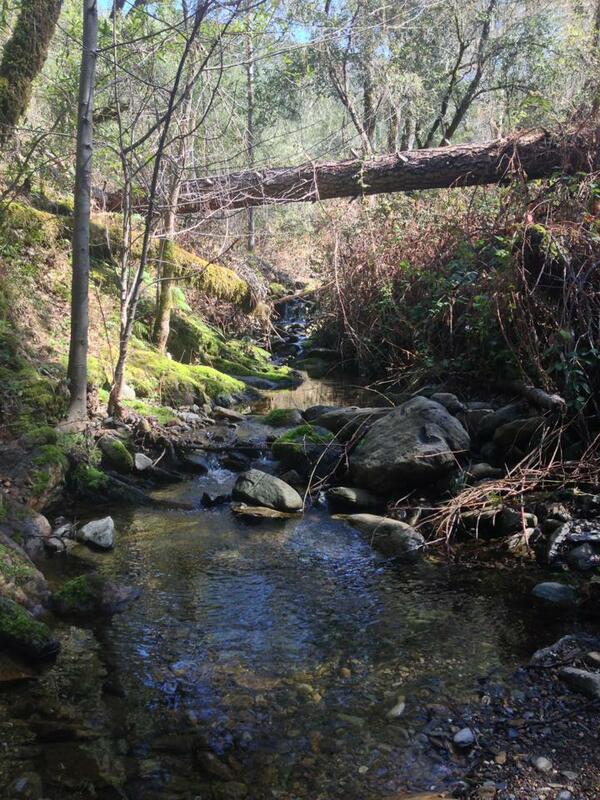 We crossed a couple creeks which I ended up just running through. I realized I was spending too much time trying to figure out how to navigate my way across a stream without getting wet and more often than not, I would end up falling in anyways. My shoes drain pretty quick and it’s always a nice “cool” surprise when you get your feet wet. 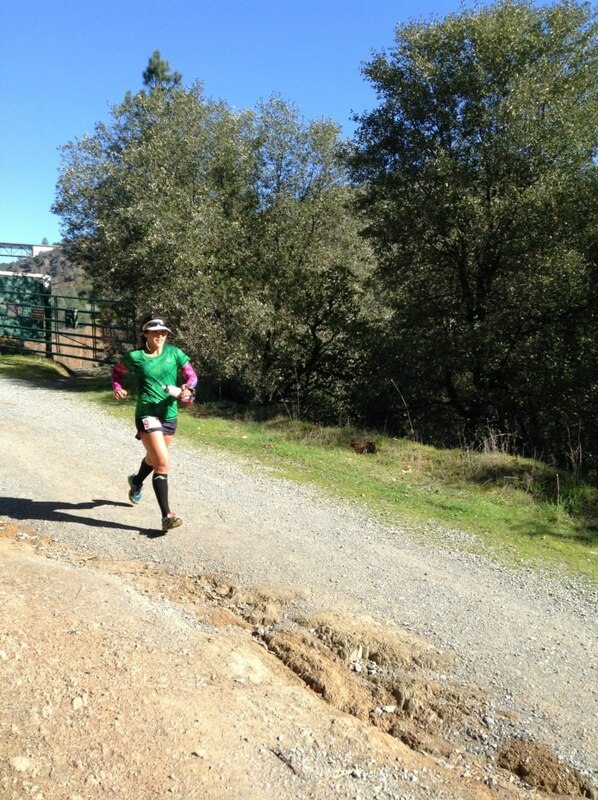 We then proceeded uphill towards the Dead Truck/American Canyon Trail Split into Mile 21, Auburn Lake Trail aid. From ALT to Goat Hill at Mile 26.4 was a nice shaded runnable single track. I wish my legs felt more fresh during this section because it was a trail you could really cruise on and pick up speed. I made it my next goal to get to Mile 26 by 4 hours. The infamous Goat Hill loomed ahead starting at Mile 26. From the elevation chart, it looked pretty much like a vertical line for a little less than a mile. Goat Hill truly lived up to it’s name, it was a steep scramble hike up, hands on your waist/thighs/floor to get to the top where the aid station awaited. I left Mile 26 at exactly 4 hours and knew I had enough time to make it in under 5 hours if nothing unexpected happened. Fun day out on the trails with great views and companionship. Can’t wait for Western States camp to run these trails again.